As yet another EMI chief executive ends up on the editing room floor the major corporate labels continue to blame piracy for their problems. But illegal copying is an interesting gauge of demand. In many cities in Morocco 100% of the CDs on sale are pirated, and you won't find any copies of the latest offerings from teenage Chinese pianists or barely post-teenage celebrity conductors among them. But significantly there is an awful lot of counterfeit ECM product available. Which, as the CD inlay seen above shows, does bring a different kind of problem. 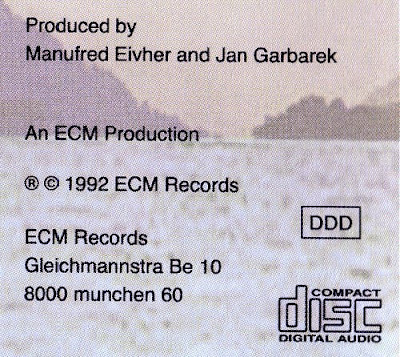 As books have been devoted to the graphic art of ECM it is worth dwelling for a moment on the graphic art of piracy. It must be assumed that the illegal copy of Ustad Fateh Ali Khan and Jan Garbarek's Ragas and Sagas seen above predated the availability of cheap image scanners as the pirated copy has new artwork replacing the ECM original seen below. 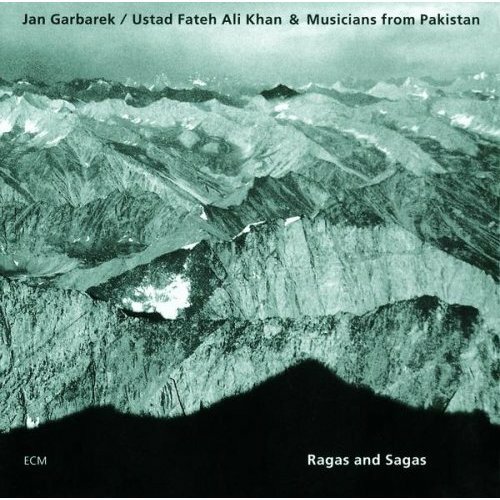 On the pirated version below, Herbert Maeder's typically atmospheric photo, presumably of one of Pakistan's many mountain ranges, has gone. Its replacement mimics the shadows in the foreground and peaks in the background using a fjord backed by mountains. A cheap copy or a flash of creative insight? Well ... saxophonist Jan Garbarek does come from Norway, and the CD was recorded in Rainbow Studios in Oslo, Norway in May 1990. And Norway is of course the country of fjords. The major corporate labels have a lot to learn from the pirates. I have started a fighting fund which accepts PayPal donations in case the the following lands me in trouble with the RIAA. 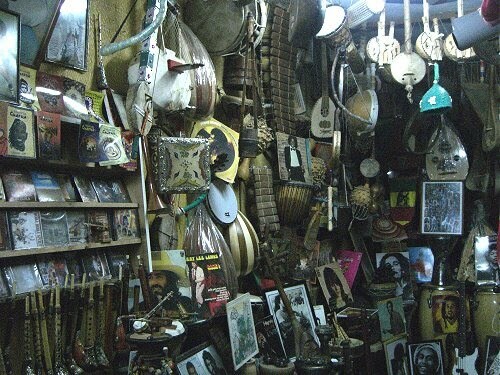 The pirated version of Ragas and Sagas was bought from the store seen below, the synchronistically named Bob Music in the souk in Essaouira, Morocco. Yes I know piracy is bad. But give me five minutes in Bob Music to five hours in the corporately bland HMV stores in the UK. If you want a kora from Mali or an oud from Morocco Bob's emporium of musical delights is the place to go, and I am quite happy to add his shop to my list of best record stores in the world. 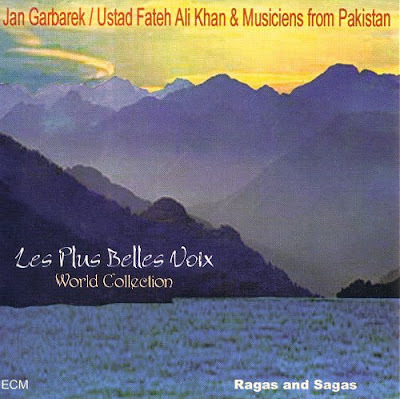 I should hasten to add that Bob Music also has some very interesting non-pirated CDs, including Platinium Music transfers of classic 1970s recordings from sufi influenced Moroccan protest band Jil Jilala, more on them soon. Piracy is not new. Back in 2005 I wrote about early music piracy. On the other side of that coin: I simply do not understand how Amazon.com, or the people who sell their product on that site, determine their prices. Now, one would think I may be flattered that somebody valued a sealed copy of this at $224.54 (American). But in all honesty, you would have to be a special kind of idiot to pay that price, let alone ask for that price. The original price, when released, was in the ballpark of $20.00 (Cdn.). And as far as I’m concerned, that’s what it is worth. And I have seen it in second-hand shops (which I DO consider a badge of honor) for around $6.00. But, $224?!?!?! This is not the only example of an over-priced disc I’ve seen for sale on Amazon. What is their rationale? It makes no sense to me. David, I think that $224 dollar price is the result of automated pricing. Many Amazon resellers use automated algorithms which simply hikes the price in inverse ratio to the number of resellers offering that product - in this case there are no other vendors with new product available. I should have explained that Bob Music takes its name from Bob Marley who is hugely popular in Morocco. Bob Marley is reputed to have visited Essaouira, although it is difficult to separate fact from fiction among the many stories about visiting rock musicians - a topic I will return to.